Zitelmann Provides Fascinating Insights Into the Entrepreneurial Mind in Trailblazing Book, “The Wealth Elite: A Groundbreaking Study of the Psychology of the Super Rich"
A 2015 study showed that, among all billionaires, the proportion of self-made wealth grew globally from 43% to 66% between 1995 and 2014. Although there are a large number of popular “how-to” guides on wealth creation, there have been few scholarly investigations into the behavioral patterns and personality traits of these ultra-high-net-worth individuals. That is, until now. 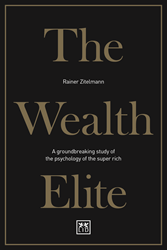 In his trailblazing book, “The Wealth Elite: A Groundbreaking Study of the Psychology of the Super Rich” (LID Publishing, 2018), Rainer Zitelmann provides fascinating insights into the world of the super rich, detailing the correlations between specific personality traits, behavioral patterns, and exceptional entrepreneurial success. Zitelmann does so by showcasing 45 in-depth interviews with individuals, most of whom have a net worth of between thirty million and one billion dollars and are self-made multi-millionaires. In order to successfully reveal the true attitudes that prove to be a condition for the exceptional economic success of these wealthy entrepreneurs, and to avoid well-polished clichéd responses, Zitelmann carried out these guided interviews without asking his interviewees for transcription approval. This is also the first study in the world in which 45 ultra-high-net-worth-individuals completed a psychological test based on the Big Five model. “The Wealth Elite” is available for pre-order on Amazon, Barnes & Noble, and IndieBound (hardcover, retail price: $34.95) and will be released for sale in the US on July 24, 2018.